Julie took this photo of Axel and Juanita’s gravestone at Mt. Olive Cemetery in Chicago. 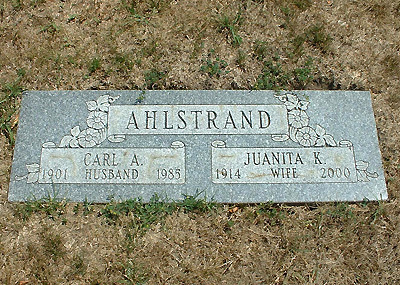 Axel was one of Carl Ahlstrand’s sons in the second marriage and lived in the Chicago area with his wife Juanita Kirby and their daughter June. He also spent a couple of years working in Los Angeles.